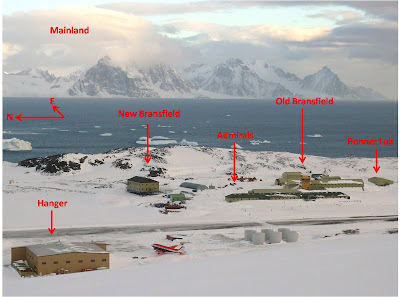 My first week at Rothera was spent learning the important aspects of base life. We had a go at driving some of the base vehicles (gators and skidoos, not the snowcats, jcb’s or aeroplanes). We did some more field training and spent a night camped up on the glacier in a pyramid tent. I also spent a bit of time finding my way around base. Rothera is about 0.5km². The central feature of the base is a 900m gravel runway with the southern end extending off the island and into the sea. To the east of the runway are the main buildings; New Bransfield (dining room, kitchen, library, lounges and bar), Old Bransfield (communications tower, logistics offices, science offices, doctors surgery and gym), Admirals (bedrooms) and the Bonner lab (marine biology lab, offices and boat shed). To the west of the runway is the aeroplane hanger and fuel farm, and the rest of Adeleide island. Wow! Brilliant to see these, I love the looking-out-of-the-tent shot, so envious.